2019 NCAA Division I Football FCS Championship from Frisco, Texas; January 5 on ESPN2 - ESPN Press Room U.S.
All roads lead to Frisco, Texas this weekend for the NCAA FCS Football Championship featuring No. 3 Eastern Washington and defending champions No. 1 North Dakota State. The game will air Saturday, Jan. 5, at noon ET on ESPN2 and available via the ESPN App. Taylor Zarzour, Matt Stinchcomb and Kris Budden will call the action. A Spanish-language presentation of the game will be available on ESPN3 with Roger Valdivieso and Alex Pombo on the call. Prior to kickoff, FCS Championship Game Preview will air at 11:30 a.m. on ESPNEWS. Kris Budden will host, joined by analysts Rene Ingoglia and Jay Walker. Cal Davis head coach and former ESPN analyst Dan Hawkins will join the show as a guest. Hawkins was named the Eddie Robinson FCS Coach of the year after leading the Aggies to a 10-season win including seven conference victories—both new school records. Undefeated North Dakota State will not only look to continue its winning streak and defend its championship, but will also look to take home a seventh title in eight years. The Bison are led by Walter Payton Award Finalist quarterback Easton Stick, running back Bruce Anderson and linebacker Jabril Cox. This will be head coach Chris Klieman’s final season with team as he recently accepted the head coaching position at Kansas State. He currently holds a 68-6 recording at the helm of the storied program. No. 3 Eastern Washington (12-2) will look to earn its second FCS title, with its first dating back to 2010. The Eagles are led by quarterback Eric Barriere, and feature an offense ranked third in the country in yards per play with a defense that is second in turnovers. This is Aaron Best’s first season as head coach at EWU after more than 20 years with the program, including four years as a player. The last time these two programs met was on September 9, 2017, at Roos Field in Cheney, Wash. with NDSU coming out on top 41-3. 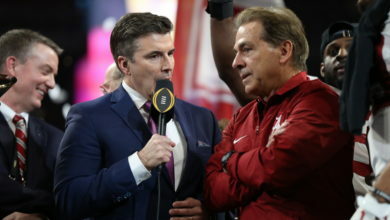 ESPN’s coverage of the FCS Championship adds to its overall college football efforts as the New Year’s Six slate concludes and attention turns toward the Bay Area for the College Football Playoff National Championship.